We have many more pictures of the Annunciation as well as a significant number for the “Nativity of Mary.” The ones for the Nativity of Mary are quite exquisite. 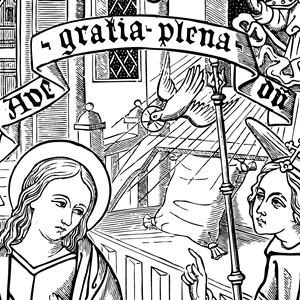 To speak truth, so are the Annunciation ones. As time goes on I will be releasing all of these. The beautiful inscription on the above image comes from the “Ave Maris Stella.” St. Robert Southwell wrote beautiful hymns on these Marian mysteries, and many are included in the Campion Hymnal . . . set to music for the very first time in history!